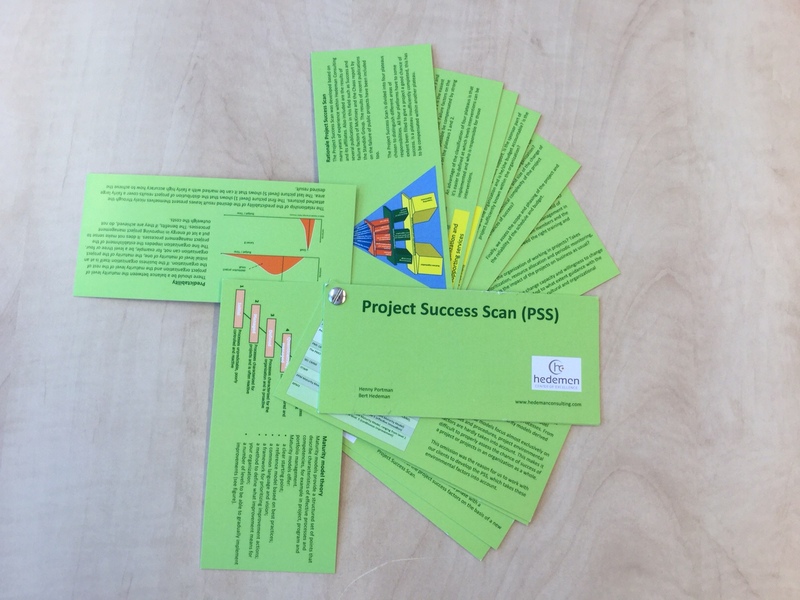 We created a small booklet (hand-held fan) with some background for the Project Success Scan. As stated in the previous blog I will summarize the missing questions in a second info-graphic. We accept to execute projects in 50% of the cases without defined goals and scope and a prioritized list of requirements. Only in 24% of the projects the willingness to change exists in terms of positive or productive energy. The size of our projects is in more than 50% too big and on top of that the organizational and technical complexity is too high. We accept in more than 66% to start with the execution with limited availability of the team. In 75% of the cases we think it’s better to reinvent than to have a centralized PMO to collect, define, maintain and share best practices. 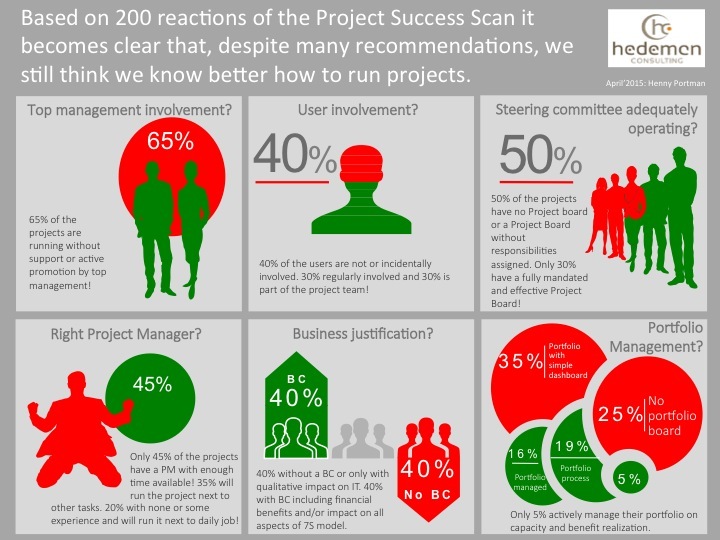 Shocking results from a first analysis of 200 Project Success Scans! If we take a list of success or failure factors you often see the same topics. 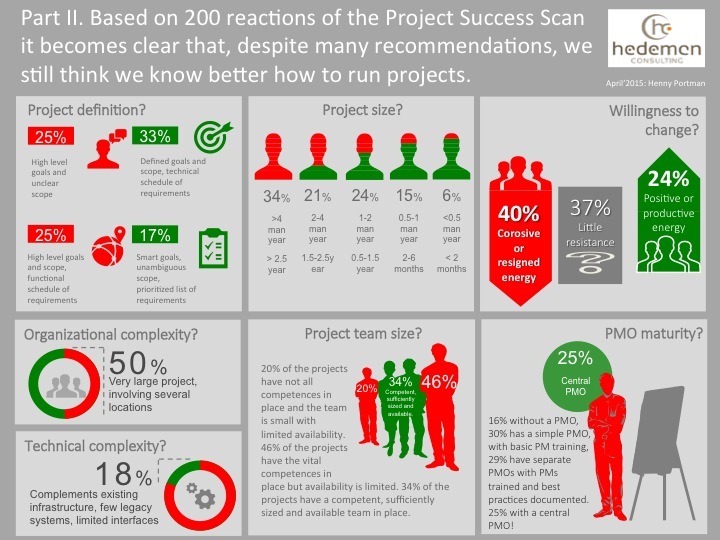 The last year we asked many project managers or project executives to take the Project Success Scan questionnaire. Plateau 4: Business organization: business organization and supporting departments. If you look for reference at the top 10 from a Chaos report from the Standish Group you find several comparable factors. Besides the project related ones (our first two plateaus) we take the impact of the environment – portfolio management and complexity of the business or e.g. the IT landscape into account too, factors which are not part of the Standish studies. Standish Chaos report top 10: 1. User Involvement, 2. Executive Support, 3. Clear business Objectives, 4. Emotional Maturity, 5. Optimization, 6. Agile Process, 7. Project Management expertise, 8. Skilled resources, 9. Execution, 10. Tools and infrastructure. In the info-graphic (PPS (Infographic I, 150426) v1.0) I summarized results from 6 questions: top management involvement, user involvement, steering committee performance, project manager experience and availability, business justification and portfolio management. Why are the numbers 1 and 2 of every recommendation – user and senior management involvement – not always taken into account? 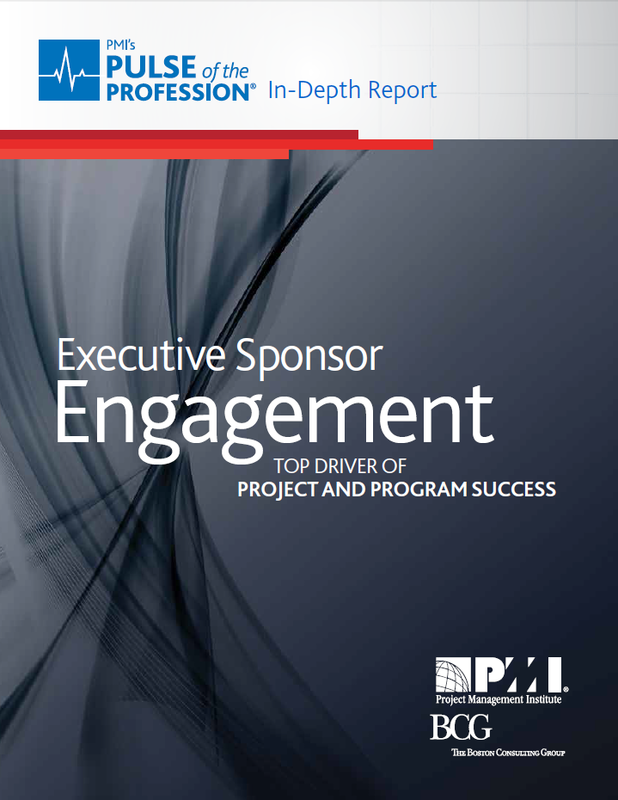 In 65% of the projects there is a lack of senior management involvement. In 40% of the projects we think we don’t need users. In 50% of our projects we don’t have a project board or we have a project board without responsibilities assigned. Only 45% of the projects have a project manager with enough skills and time available. Only 40% of the projects have a business justification. Only 40% of our projects are managed via formal portfolio management. 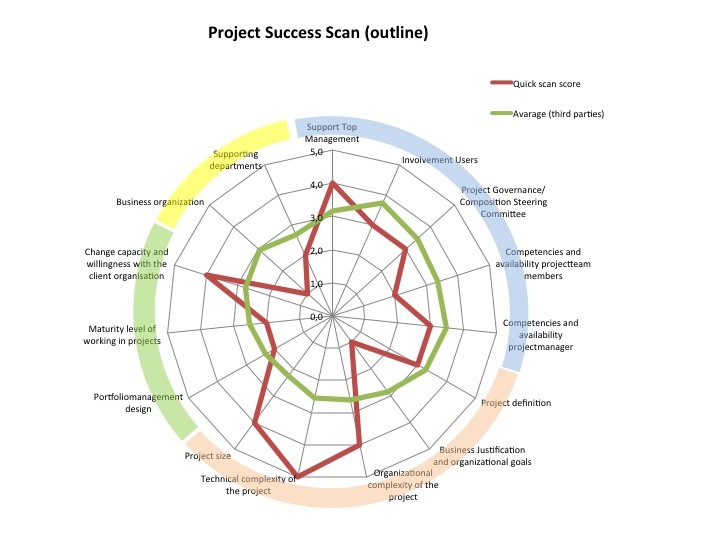 In a next post I will go into the other questions of the Project Success Scan. questions regarding the project definition, the project team, project size, organizational and technical complexity, change capacity, and PMO maturity level.